Aren’t these fruit kebabs just so pretty and cheerful? I think so! These are a fantastic dessert to serve kids. They are definitely a treat, and a healthy one at that! Most melons are in the peak of their season during the summer months and are therefore incredibly sweet. These can be made on large wooden skewers, or small wooden or plastic toothpicks. Adding the bit of mint between each chunk of melon, perfumes the whole kebab with its wonderful scent. 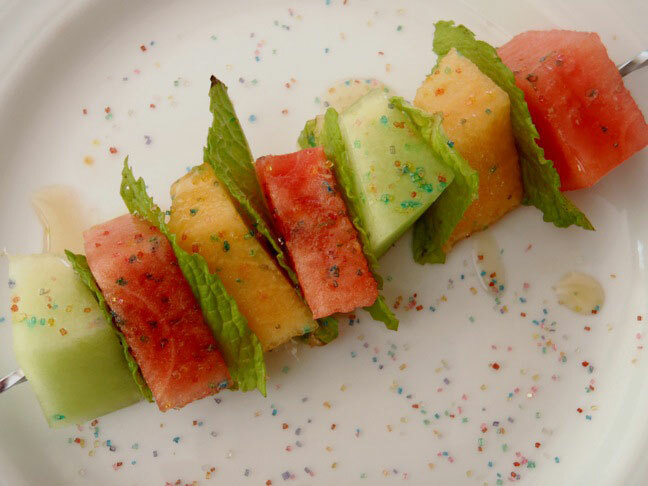 I love to sprinkle these pretty fruit kebabs with a bit of colored sugar. It makes it playful and fun! Check out Stacie Billis‘ article on how to Color Your Own Decorating Sugar! Cut the desired number of chunks from the melons, about 1 inch each. Add them to the skewers or toothpicks, placing 1 mint leaf between them as you go. Drizzle with honey and sprinkle with the colored sugar. If you’re lucky enough to be shopping for melons and see Galia – buy it! They are amazingly sweet, juicy and delicious! I believe it’s only available from approximately July through August. If you don’t make your own colored sugar, it’s usually available in the cake decorating sections of most markets.